James Johnson's sense of humor is one of the first things you will notice when you walk into a music store and pick up his CD. When you play it you'll notice that not only is he a funny guy but he is an excellent songwriter and musician. When you meet him in person his genuine friendliness and straight ahead way of dealing with life will make you glad you did. James Johnson grew up in the small towns of rural Mississippi, as a small child he was fascinated by the chickens that his parents kept in the yard and would try to figure out thier language. 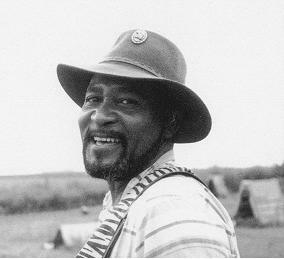 Friends and relatives began calling him "Chikan Boy" and the name stuck as those kind of names do. When he grew older and learned to play the guitar and began to play music people would come up and say, "Aren't you that Chikan Boy?". Bowing to the inevitable but making the best of it with flair "Chikan Boy" became James "Super Chikan" Johnson. 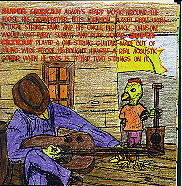 Now across festival stages, juke joints, and cruises you can hear the "Super Chikan" cackle from his guitar as he plays "Super Chikan Strut". 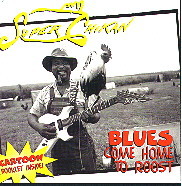 Lest you think all his songs are about chickens or contain chicken lyrics give a listen to "Down In The Delta" or "Mama and The Chillen" on his "Blues Come Home To Roost CD" on Rooster Blues. 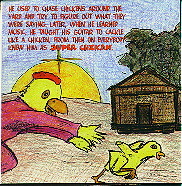 Super Chikan's story in cartoon form comes with the CD.